Our Gold Coast Hurricane Shutters and Fence manufactured Impact resistant windows, are the preferred choice of leading home builders and commercial contractors. You will find the best savings because we are the direct manufacturer of all of our hurricane products. If you find lower prices on Hurricane Shutters we will match them and beat them. We look forward to serving your Hurricane Protection needs, with impact resistant windows, for many years to come because we believe that hurricane protection is not expensive... It's priceless! Count on our Gold coast experts; FREE estimates await you, and a FREE outline of your most secure options, at the best prices. We are the preferred hurricane shutter manufacturer for many home builders and commercial manufacturers. We offer a wide selection of shutters in South Florida. We sell the highest quality products at competitive prices. We eliminate the middle man so that we can bring the savings to you. Increase the re-sale value of your South Florida home or business. 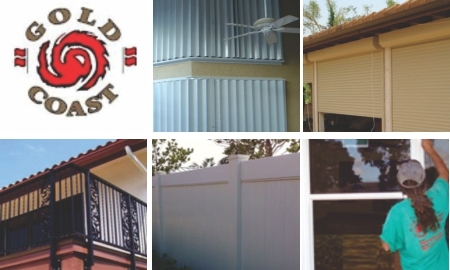 Gold Coast Hurricane Shutters and Fence is South Florida’s leading Hurricane Shutter Protection company. Gold Coast is family owned and operated with over twenty years of experience. We have served our local Florida and Texas communities with honesty, integrity, loyalty and the best prices and service in the industry. We offer the highest-quality hurricane protection products at the most competitive prices. Gold Coast manufactures, supplies, and installs a large variety of hurricane protection products. We are one of the largest accordion shutter manufacturer in the world. All of our Hurricane Shutters and Storm Shutters are Miami-Dade, Broward and Palm Beach Florida building code approved. Gold Coast also offers a full line of fencing, including aluminum fences as well as aluminum balconies and gates in any design, style or color. For maximum impact resistance and durability, use our products with total confidence. Past clients are happy, loyal, and referring us to their family and friends. Architects suggest our products and some design, deliberately, around our products, blending them into their concepts. Do not fool yourself; get a FREE estimate and get cracking on your Hurricane Protection Plan; no one else can to do it for you.